Aizawl, Jan 21 : Mizoram government has rushed a platoon of armed police to Buhchangphai area bordering Assam after some officials of the neighbouring state asked the farm workers there to leave the area, according to an official statement on Tuesday. The statement said that Assam officials had asked farm workers in Buhchangphai area to pull down the farm huts claiming that the disputed area belonged to Assam yesterday. Policemen, commanded by Sub Divisional Police Officer (SDPO) of Vairengte, were deployed in the area, the statement said. 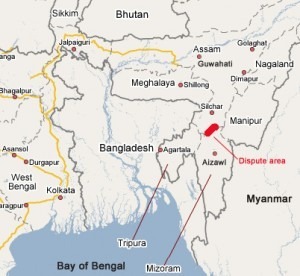 Areas bordering Mizoram and Assam have witnessed several violent incidents in the past over inter-state border dispute, it said. Mizoram’s border row with Assam has continued after a nine-month hiatus, with Mizoram’s Parliamentary Secretary K Lalrinthanga warning the state “may not refrain from entering [Assam] territory to harass [Assam] residents if Assam police and forest personnel continue to intimidate and threaten” farmers of paddy-fields at the interstate boundary. Assam Police and Forest personnel posted in southern Hailakandi district had on Monday reportedly threatened farmers at Buhchang, a village in Mizoram’s Kolasib district, to dismantle their huts and remove themselves from their farms that Assam claims is part of its territory. Mizoram has responded by posting armed policemen in the area, just as it had done last April when two platoons were posted there in the wake of Assam police and forest officials dismantling the same huts in the same paddy fields. Government sources said the SPs of Hailakandi and Kolasib districts have spoken to each over the phone with respect to the latest incident at the border. K Lalrinthanga, who is also the local MLA, visited Buhchang and nearby areas on Tuesday.